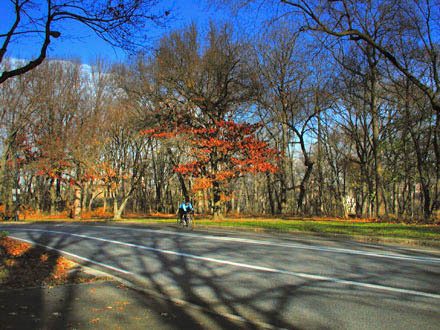 Miami In Focus Photo Gallery of Heartbreak Hill W108 in Central Park. Appropriately named Heartbreak Hill, this steep incline after 108th Street winds its way through the North Woods in many treacherous curves. Getting to this point is something to be avoided for the less experienced runners who may have a bit of difficulty with the demanding climb. Reaching the summit might be a victory for runners, but its steady drop is particularly dangerous for in-line skaters who can easily lose themselves in the steep incline. 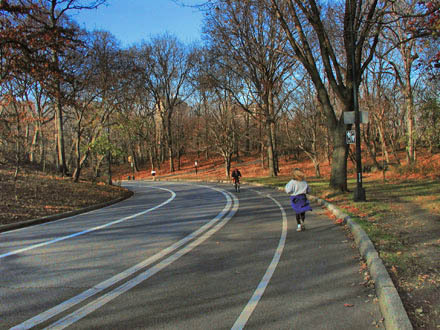 Only the most experienced skaters or runners should consider this potentially stressful route. Not withstanding its dangers it is still one of the most scenic landscapes along the loop. Watch out for the bikers who race along the winding curves.